Occupied bat house in central Florida . The significant level of displacement at this site (right) continued for several days.. Roost mitigation was declined, by the property owner and the bats eventually moved to unknown locations. Successful exclusion is not the same as successful population management. Regardless of method, exclusion ALWAYS results in roost loss and colony displacement. When large numbers of displaced bats are suddenly forced to search for new suitable roosts, colony fragmentation and population decline can be easily masked by reports of bats sudden ‘population’ increases — an artifact that occurs when alternate roosts are limited or absent and displaced bats are forced to assimilate with colonies in neighboring structures. Without roost mitigation, displaced colonies fragment and are forced to move to nearby buildings where they are vulnerable to future management or control measures. If alternate roosts are not available, the displacement cycle will continue until we eventually lose our ‘common’ bats. 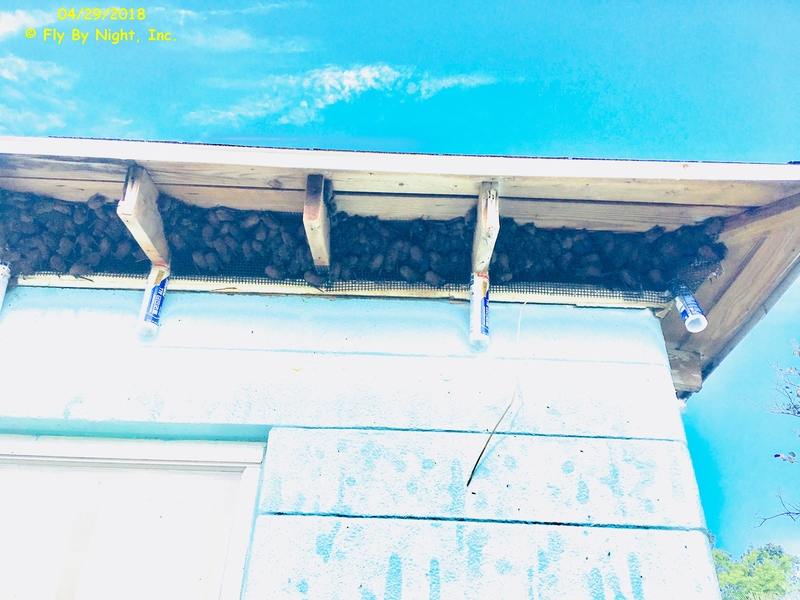 Displacement can not be prevented, but it can be effectively managed with advance roost mitigation roost mitigation provided Suitable alternate roosts are needed to mitigate roost loss, but are rarely provided; leaving urban bats caught in a cycle of eviction, exclusion and displacement. When properly implemented, well in advance of scheduled displacement, bat houses can provide displaced bats with suitable alternate roosts. Successful bat houses can transform what may had been an on-going problem into a valuable conservation asset. These managed roosts can provide a long-term, win-win solution that benefits the local community as well as the bats. In the absence of roost mitigation, displaced bats are forced to move to nearby buildings where they are vulnerable to additional management or control measures. The displacement cycle will continue until we eventually lose our ‘common’ bats. Roost mitigation projects should be site and species specific. Techniques can include everything from installation of alternate roosts to full site protection or even complex projects involving controlled or temporary exclusion and custom modifications at occupied sites. Bat houses or other alternate roosts installed during urban bat management projects have an occupancy rate over 90% and can be an effective management tool. Breaking the exclusion / displacement cycle occurs simply by providing displaced bats with a safe, suitable alternate roost. However, bats need time to recognize a bat house as a potential roost site and initial occupancy takes time (our occupancy record is <12 hours -- see Appendix 2, Example 4). Most are occupied within a year. Roost mitigation should always be initiated as early as possible prior to a scheduled exclusion and should be installed as close as possible to the occupied structure. Bat houses work beautifully once established. 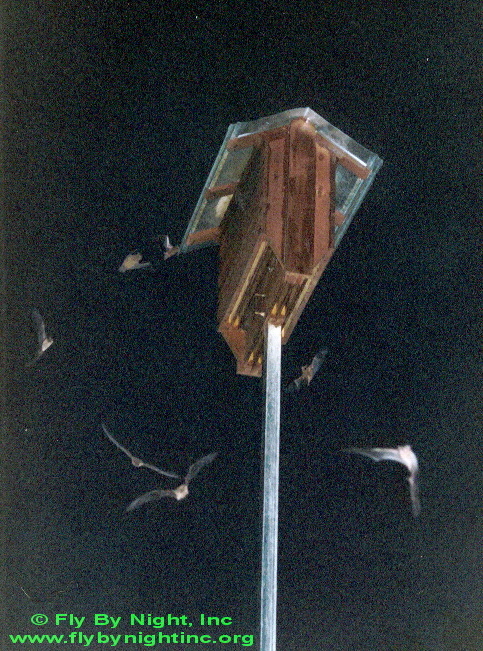 As bat populations adapt to roosting in bat houses, rather than buildings, additional houses are often occupied soon after installation. All content on this site is property of Fly By Night, Inc, and not to be duplicated for use without prior written permission and proper citation. Ensure conservation of the local bat population and breaks the exclusion/ displacement cycle.